Join Mishpacha in Motion (Beit Midrash in Motion’s Family program) for fully EMBODIED and fun filled workshop at LIMMUD BOSTON. Beit Midrash in Motion thrilled to be presenting workshops at Temple Israel Center’s kick-off for their Torat Hayyim, Tree of Life year of learning. 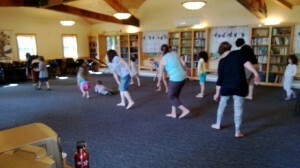  Dance with Dalia Davis of Beit Midrash in Motion.